Fermented beet juice, also known as beet kavss will help you get some of the benefits of beet juice and whole beets in a tasty, interesting way. This is a Ukranian drink that is purported to have healing benefits. It certainly contains all of the benefits of beet juice and you can even make this without a juicer. To get whey, simply follow the recipe for Coconut kefir and the liquid part that drains off of the kefir is whey. When refrigerated, the whey can be preserved for months. 3 medium or 2 large organic beets, peeled and coarsely chopped (Do not use grated beets since this will cause your drink to ferment too rapidly). Place beets, whey and salt in a 2 quart jar. Add water to near the fill line of the container. Stir well and cover tightly. Keep this at room temperature for 2 days, then place it in the refrigerator. To serve, pour through the strainer. Add the strained pieces back into the jar. To use as a tonic, drink 4 ounces in the morning and 4 ounces at night. Trim, peel, and grate the carrots and beets. (use a food processor with a grater attachment, if you have one). Place the dressing ingredients in a large salad bowl and mix well. Add the grated carrots and beets and toss until well combined. Let the salad stand for 30 minutes before serving. 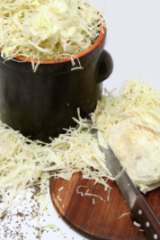 The grated vegetables will create juices making the salad moist while letting the flavors naturally mingle. 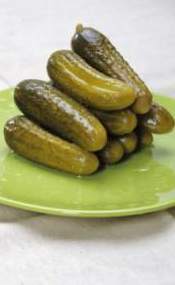 The fermentation process yields the desirable end product of fermented foods. These fermented foods are raw, naturally preserved, loaded with friendly bacteria, easy to digest and very tasty. Another by-product of fermentation is that the bacteria may produce beneficial enzymes. Fermented foods are truly live foods. They are live in two different ways. First, they are alive because before they are fermented, they are raw and living foods. Fermentation does not involve damaging heat to “cook” foods. And second, fermented foods are alive because they are full of living, beneficial bacteria that immediately goes to work to populate your gut and increase your overall wellness. To enjoy the most of the many health benefits of beet juice and whole beets you'll want to use the deep, dark, purple red beets. They have the most nutrition. However, the white, yellow and striped beets are wonderful to have in recipes and for shredding in a salad.